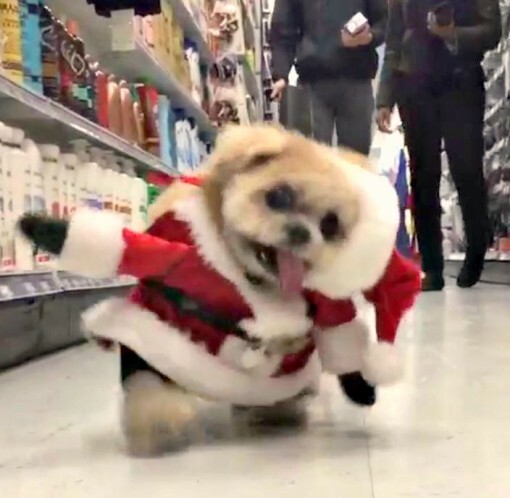 I don’t have much of an “awwwwwwww” factor and I shrug my shoulders at the same dog and cat videos that make thousands smile, “like” and feel all warm inside, but when you have a little dog with its tongue perpetually “wagged” dressed in a Santa suit that gives the illusion that the dog has two legs instead of four…. well, you now you have me feeling something. I enjoyed this ridiculous Instagram video so much that I showed the video of this little pup with the stuck tongue whenever I have a conversational cue regarding dogs, puppies, Christmas, Santa Clause, supermarket, or tongues. Marnie be this little critter’s name and it’s a little Shih Tzu that was rescued from the streets of New York. You can see the original video on Instagram.